“Green Pheasant (Phasianus Versicolor)”, 1749 (Kan'en Era), published by Nishimura Genroku 西村源六 in collaboration with Shibukawa Seiemon 渋川清右衛門 and Shibukawa Yoichi 渋川与市 in 1749—a year after the artist’s death—in volume 2 of the three-volume set of prints featuring birds, flowers and animals, “Unpitsu soga” 運筆麁画 (trans. “The Moving Brush in ‘Rough’ Painting”). 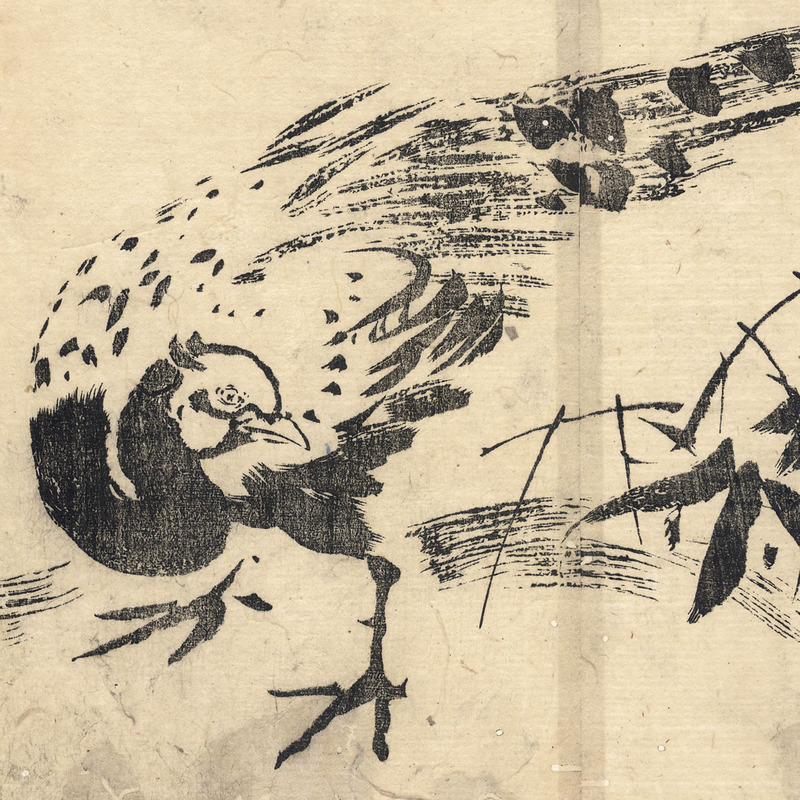 Two-panel woodblock printed in black ink on mulberry paper joined at the centre as a single image that has been trimmed inside the image borderline and backed with a support sheet. See also: Jack Hillier & Lawrence Smith 1980, “Japanese Prints: 300 Years of Albums and Books”, BMP, London. Condition: a coarsely printed but elegantly minimal impression that is part of the 'so' or cursive style designed to capture the freshness of a sketch. 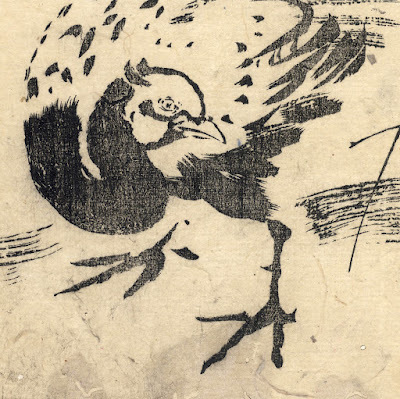 There are small insect holes, old patches of backing restorations and signs of handling appropriate to the centuries of use since the print was published. 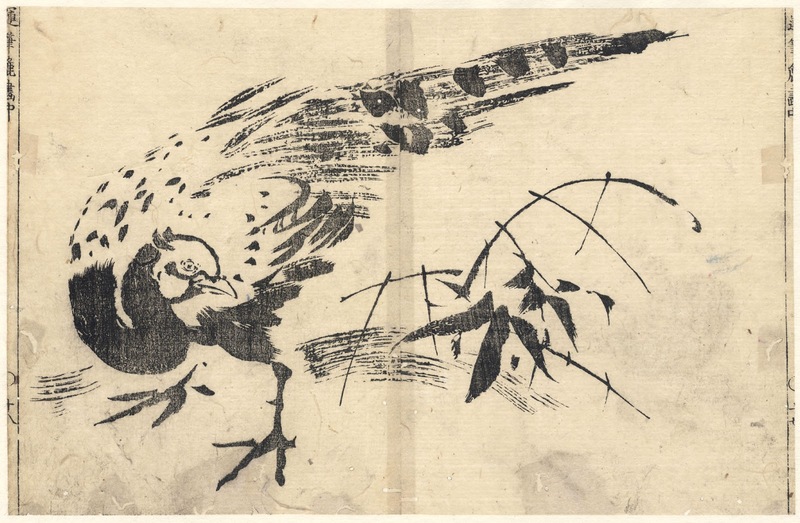 The two panels of woodblock prints that make up the complete composition have been pasted together and laid upon a support sheet of archival (millennium quality) washi paper. I am selling this rare impression of supreme minimalism and compositional elegance for AU$214 (currently US$161.40/EUR134.88/GBP119.30 at the time of posting this listing) including postage and handling to anywhere in the world. If you are interested in purchasing this early and very poetic diptych woodblock print, please contact me (oz_jim@printsandprinciples.com) and I will send you a PayPal invoice to make the payment easy. Beyond the technique of “lowering’ the surface of the woodblock plate to simulate the appearance of rapidly laid ink strokes, I wish to point out one of the key attributes of lines made quickly by great artists: the special way that they “end” their strokes and arrange placement of their strokes to ensure that the expressive energy of negative space (i.e. the white of the paper) is contained. For instance, note how the seemingly flicked stroke representing a curved stalk of shrubbery at the far right of the image has a “hook” at its furthermost end. This “hook” is a naturally created backstroke as the artist’s hand returns to its starting position. 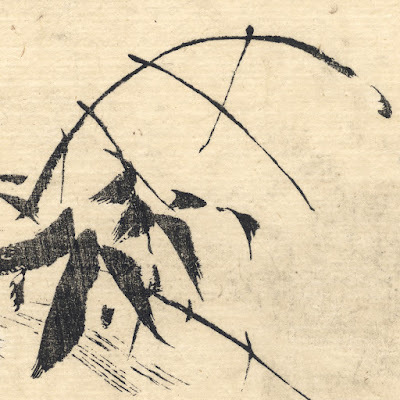 What makes it “special” and important to a great artwork is that this tail-end hook stops the expressive energy of a line dissipating by keeping the flow of marks returning to the core of the subject.